I feel like I have spent the last month drastically overhauling my physical life. And I have. But now, I’m ready to focus on making me time and self-care. If you’ve been following along with me (from my writing to going all out for Halloween), you probably know that I like being creative. This job definitely requires a degree of creativity. I spend most days writing, picking out photos, and cruising Pinterest, which means that when I go home and crash into bed to watch Netflix with my dog, I don’t really feel guilty. But I have spent my life going through creative phases. I like to learn new things, and I like to make things, which has made my life a long line of creative experiments. Over the years, I’ve mastered soap making, candle making, jewelry making, origami, juggling, the yo-yo, theater makeup, knitting, and crocheting, to name a few. And not only do these random projects (sometimes) leave me with nice, new stuff, creativity has many benefits. I find that creative activities relax me. They let me disengage from the stress of my work and social life and just do something I enjoy. They also make me feel accomplished. When you write a blog post, take a picture, even make a nice meal, you don’t always feel like you’ve actually added anything to the world. But even these simple creative activities can make you feel like you’ve achieved something. That plain piece of paper is a heck of a lot cooler as a swan. And I’m not the only one. As this CNN article talks about, we stress creativity in our kids because it matters. Even as funding for the arts falls in high schools, most parents with preschoolers still know finger painting and coloring matter. Creativity helps you believe in yourself, learn to deal with failure, continue to learn throughout your life, and even know yourself better. And the more you exercise that learning portion of your brain through fun stuff, the easier learning things for say, work, can get. And that’s why Rally also has a mission to help you remember to do something creative. This is one of my favorite missions on Rally because that creative stuff can get really lost in the shuffle of daily life as you get older, but it really is important to make time for it once in a while. So here are some of the projects I’ve done or am planning to do that feed my creative side. Maybe they will inspire your own creative juices. As I’ve said before, you never really know what all you can get out of writing until you start. Maybe you won’t end up with a finished product you can use, but you can definitely get something creative and fulfilling out of talking to yourself through writing. I recently painted a shelf gold for my new(ish) apartment, which I will show you when I talk about organizing . But if you’re anything like me (or my HGTV-addicted mother), few things are as satisfying as making something beautiful or helpful that you use in your house every day. If you’re looking for some cool and affordable DIY projects (and tips) for your home, explore this list. I have the advantage of knowing how to use some software that lets me create some pretty fun artwork for my walls, which is great because drawing isn’t always my strong point. But you can always find a quote that you love, make it look pretty, and hang it. And sometimes, with a nice frame, your doodles can look amazing on your walls, too. Or just spend a day scrapbooking and reliving some good memories. I’ve never really thought about myself as a plant person, but it turns out, I kind of am. As I’ve mentioned before, I’m obsessed with terrariums, and I own an orchid. I also recently bought a lavender topiary on a trip to Nashville. It smells amazing but requires regular trimming. But the biggest way I think I just have to expand my plant collection is by growing indoor herbs. There are loads of different kits online and plenty of advice. Fresh herbs are expensive, but they make every meal so much better! I end up throwing a lot of the ones I buy away because they go bad before I can use them all. Growing your own herbs means you can have a never-ending supply of the ones you use most, and they won’t go bad. I think I will go with mint, cilantro, basil, and rosemary, but you go with what you will use! And of course, if you’re interested (and don’t live in a tiny apartment), growing a full garden can be amazing. It would be great exercise to work outdoors, and the fresh fruit, veggies, and flowers you get out of it can only add good things to your home. There are tons of books out there to help you learn these sorts of things, and better yet, lots of free (or cheap) patterns all over the Internet. And nothing else I’ve ever made is as satisfying as the things I can wear. When people ask where they can buy something you made — there’s nothing better! If you love fashion and want to learn to sew, I have the book for you: Famous Frocks by Sara Alm and Hannah McDevitt. My mom got this for me for Christmas one year, and it has patterns so you can make your own versions of some of the most famous dresses from this century. (They also have a Little Black Dress version!) It is a little pricey at about $20, but you get 20 dress patterns with it. That’s a whole new wardrobe! Etsy is also the place to go to find cheap, wonderful patterns. 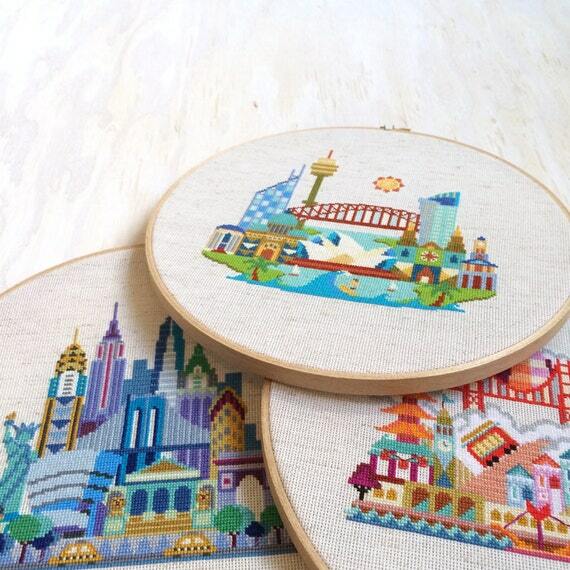 For instance, I plan on making a complete set of these cross-stitch cities from Satsuma Street for adorable nursery art the second my sister-in-law gets pregnant. Creativity time is my me time. It’s when I get away from the hectic demands of my life and just make something. So the important thing is to take the time to try something new and make something you love!